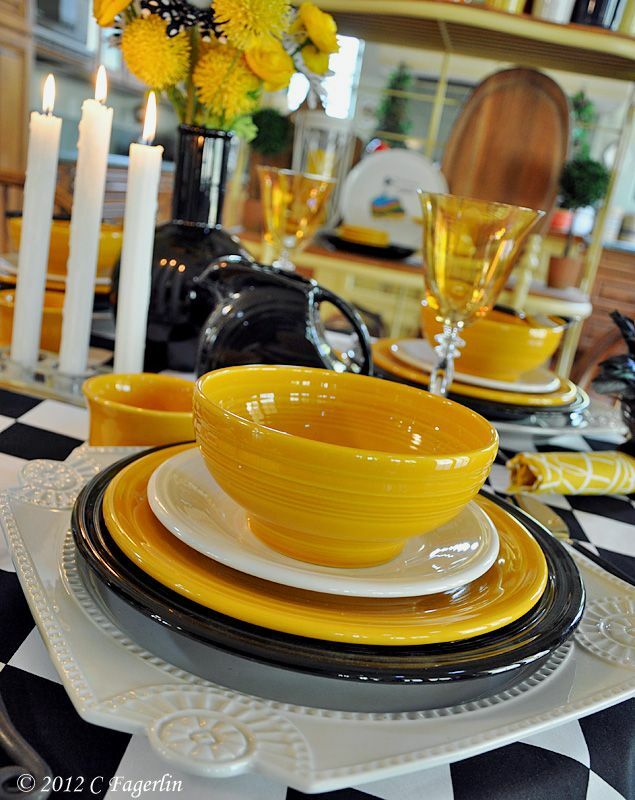 Homer Laughlin began making its iconic brand of Fiesta Dinnerware in 1936, 75 years ago. 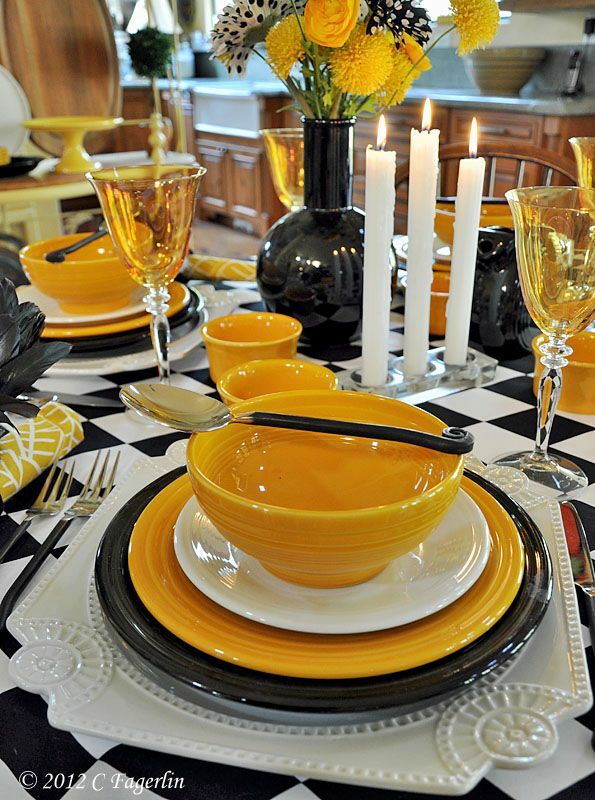 Fiesta was originally designed by Frederick Hurten Rhead; today it is the most collected brand of dinnerware. 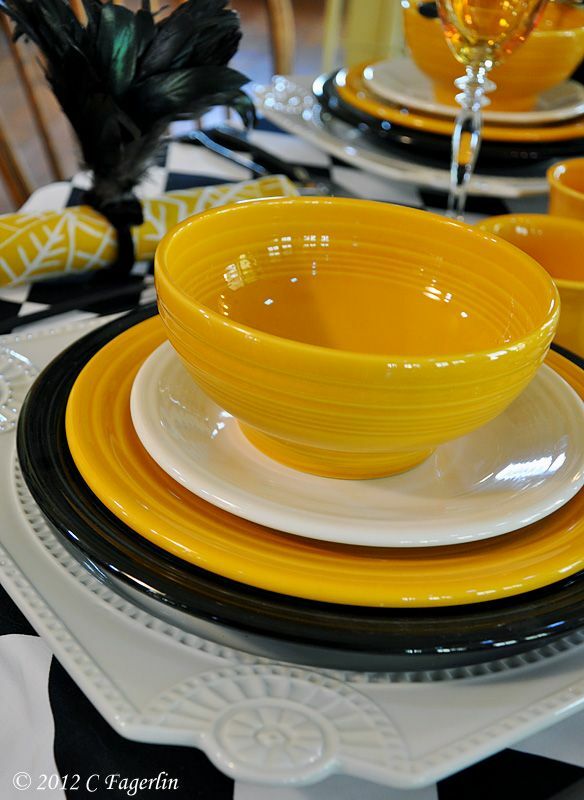 Made at the original historic factory in Newell, WV, Fiesta Dinnerware continues to top bridal registries as the must-have in everyday dinnerware. 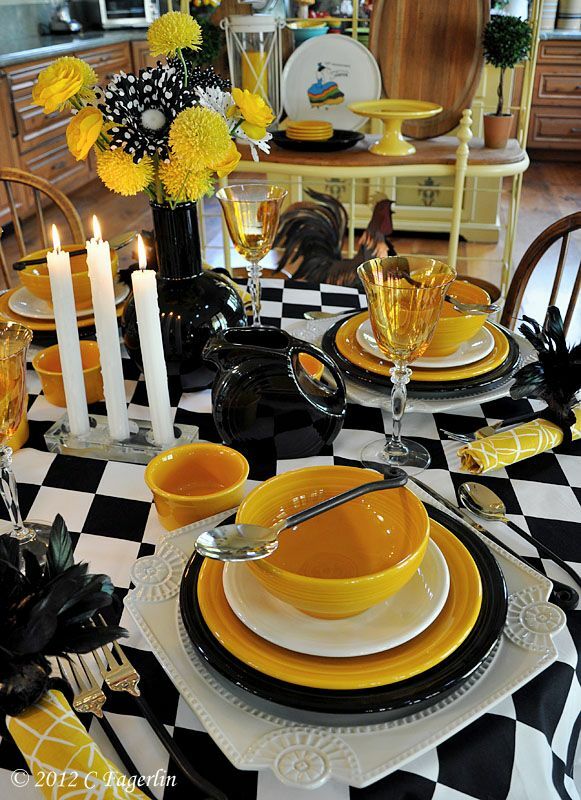 Truly a leader in the housewares category, Homer Laughlin is the largest and last remaining major dinnerware manufacturer in the United States. 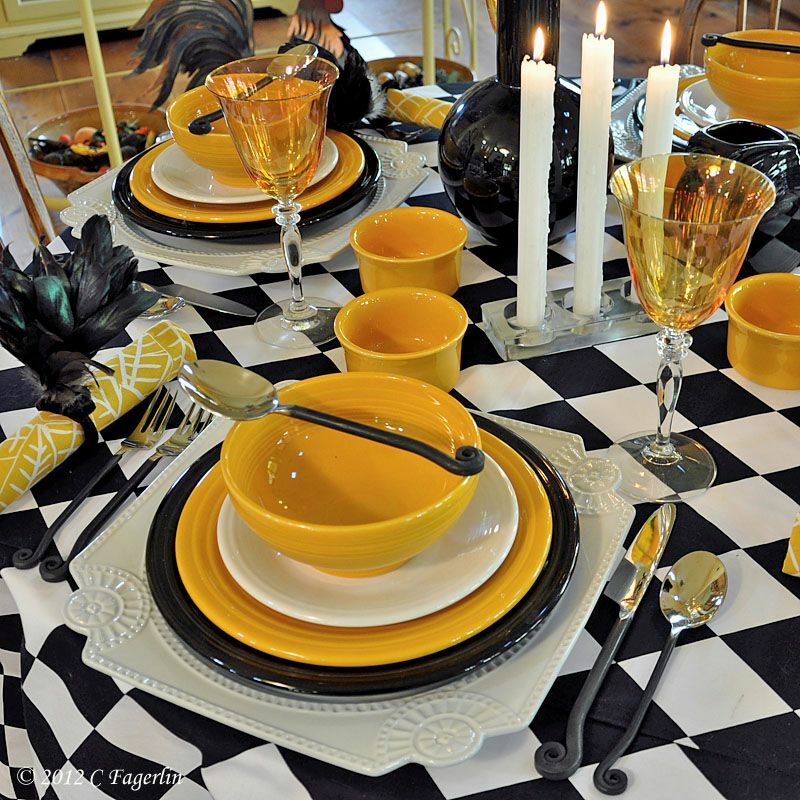 What a fabulous, fun table!! Love the color combo, and those charger are gorgeous!!! 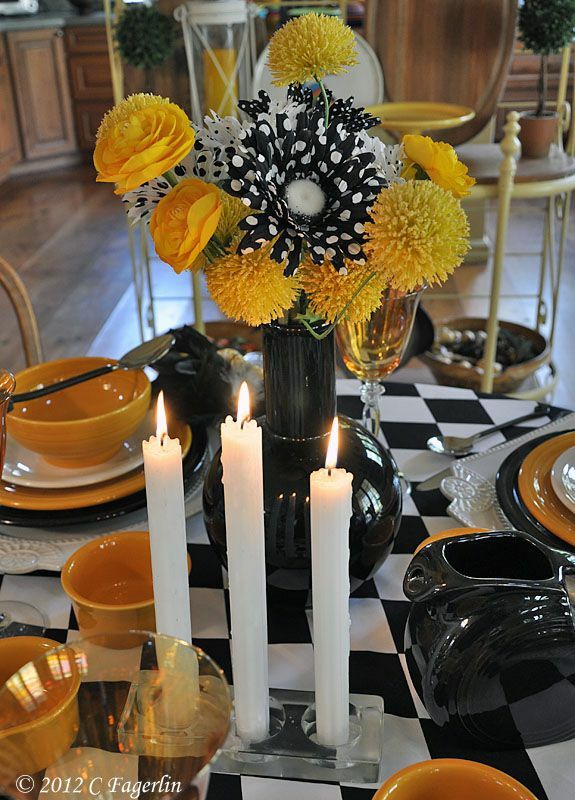 Love the tablecloth with the marigold! wowzer! 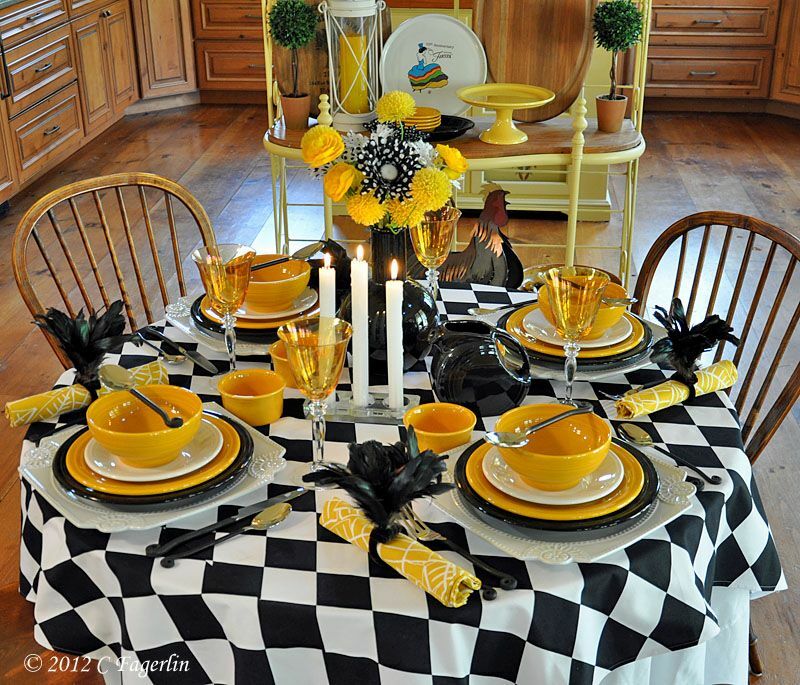 I so love this tablescape...this is pure sunshine! 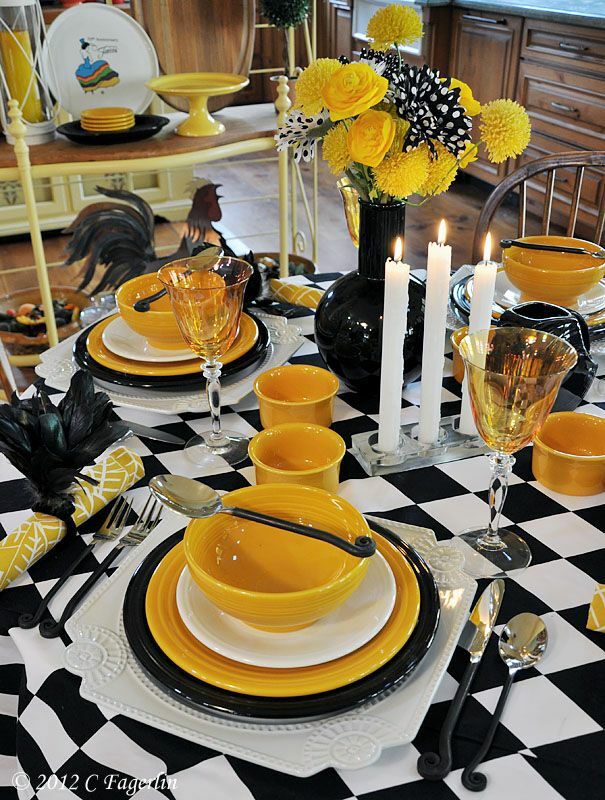 How striking the combination of black and yellow against the checkboard. 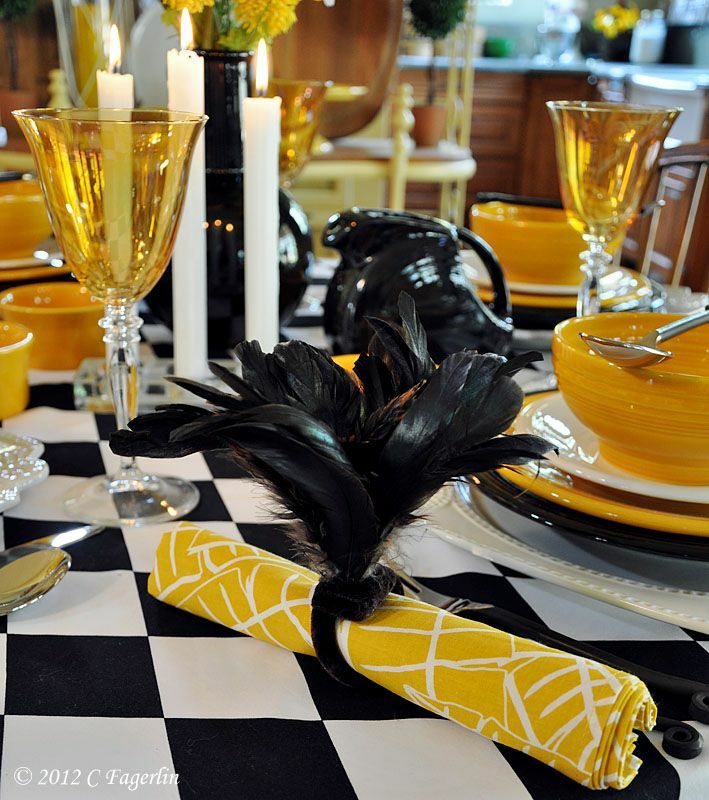 The feather napkin rings are an unexpected touch. I was just looking at them at Pier One and I think they may have to come home with me! 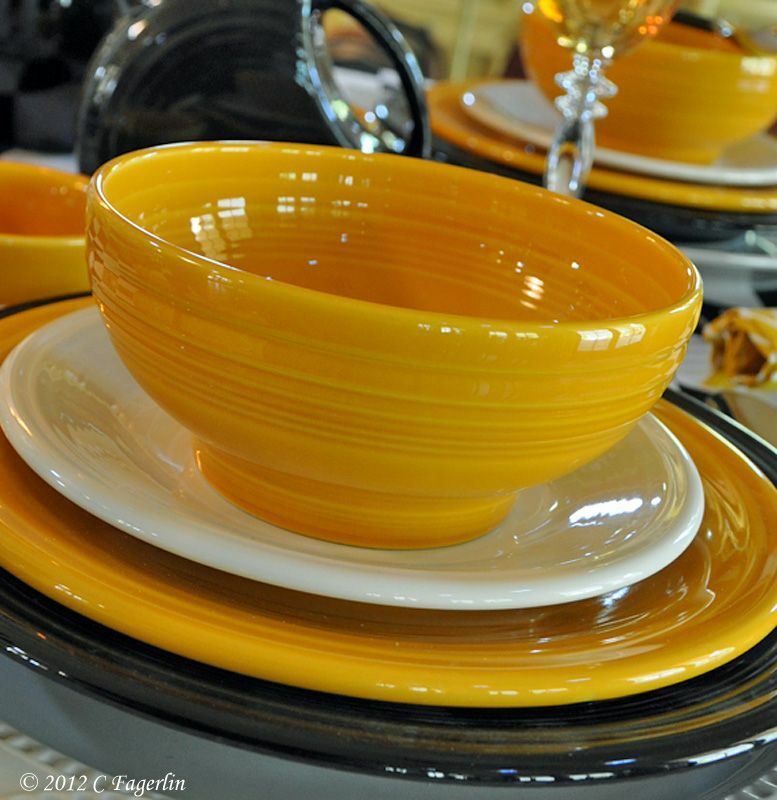 The yellow ware sure is gloriously happy. Great tribute table! Great table. 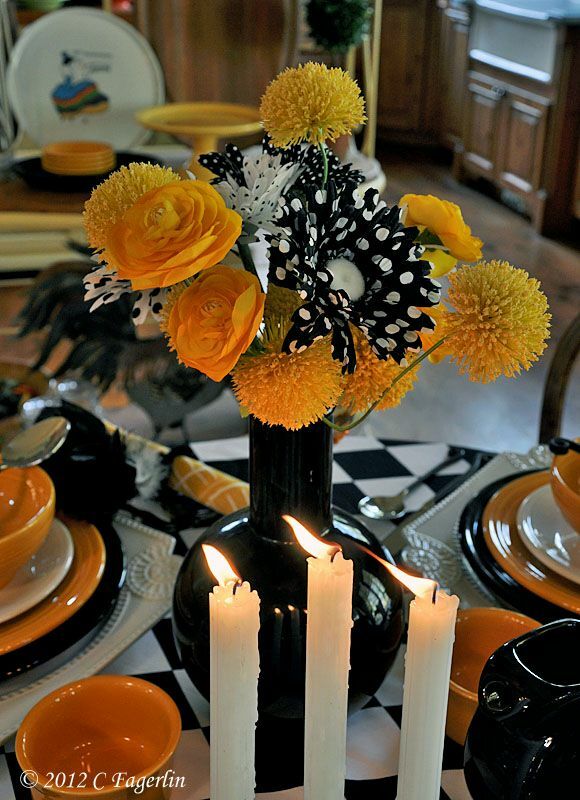 Love the black and yellow..so dramatic and gorgeous! 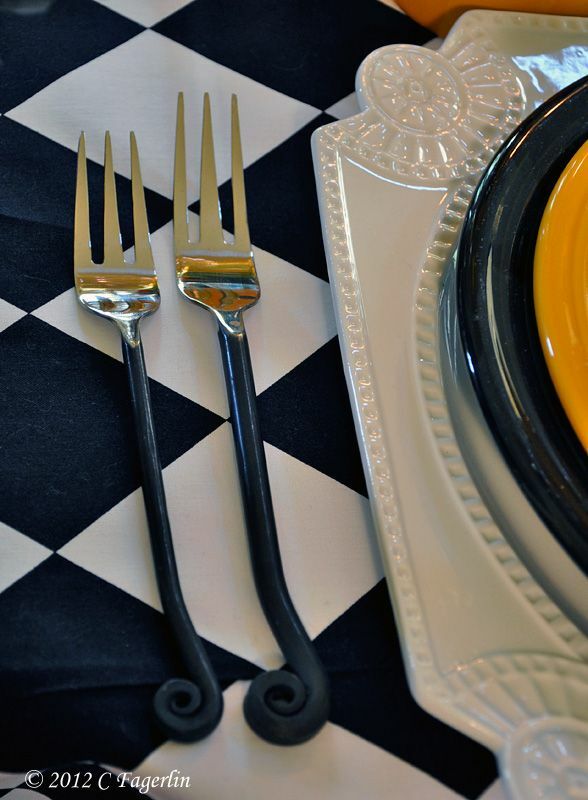 The diamond pattern and mix of yellow, white and black is so pretty. 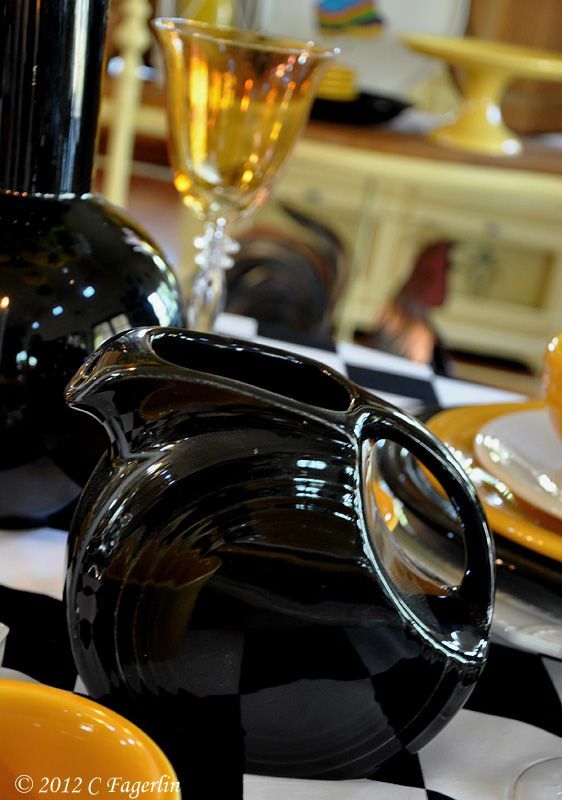 Love the information you added about the dishes history..I am a linen and dish lover too! Enjoyed my visit! What a GORGEOUS table! 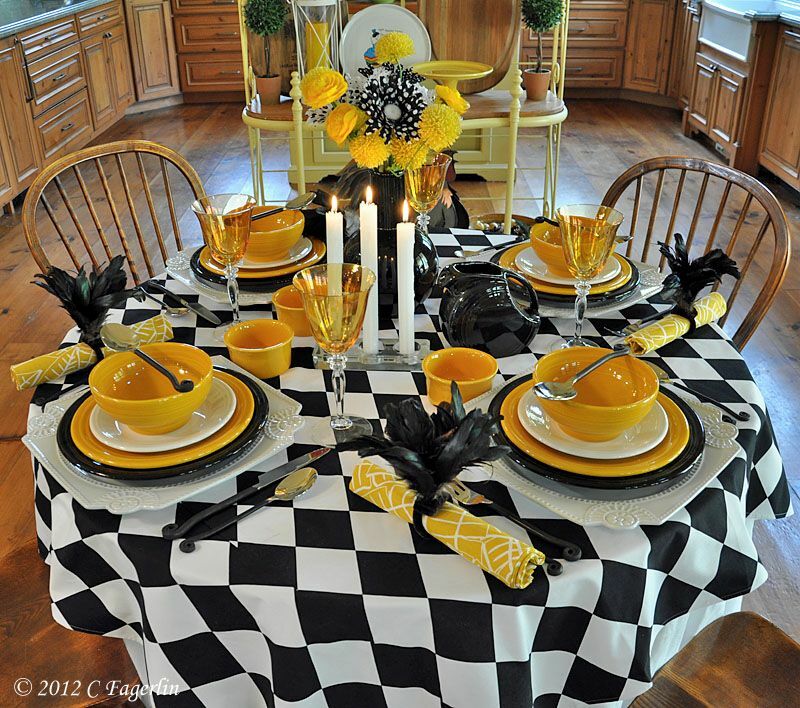 I love black and yellow and this is just perfect! 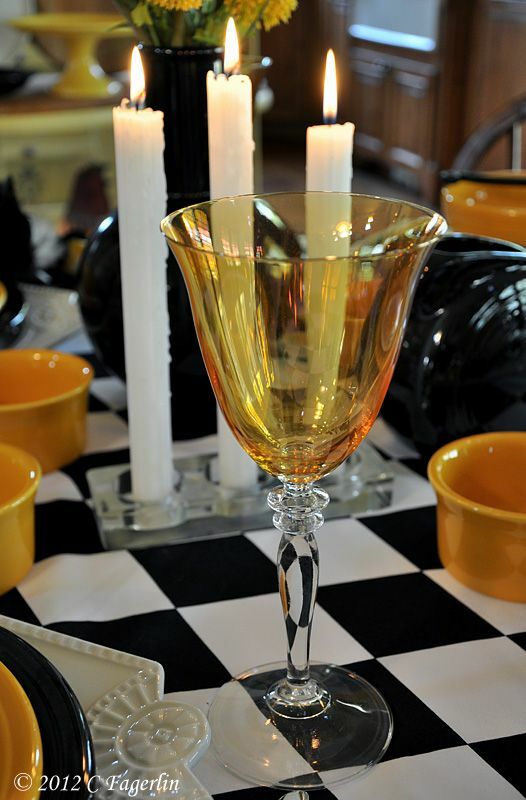 Your amber goblets are wonderful. What great pictures and wonderful collection. Thanks for sharing this. Thanks to all of you for your sweet comments, so glad you enjoyed this table. Love this! I have marigold fiesta! May I ask where you got the harlequin fabric? Please pm me at dmandrsn@aol.com . I would be forever grateful, I'm a huge fiesta collector. I bought the fabric online Dawn Marie. Thank you Candy! I will look for it. Thanks for your great blog also:).